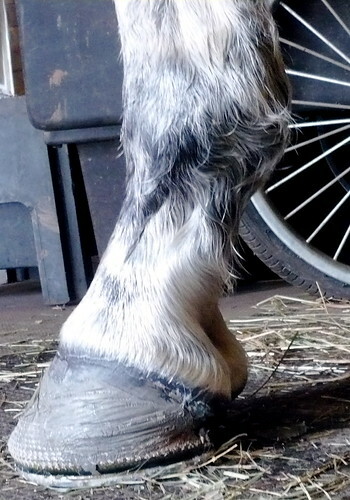 How long do you think that it has been since that foot has been shod? 5 weeks? Maybe 6? It has officially been almost 8 weeks! Can you believe it? I know I couldn’t. I had my farrier out on Saturday to do both boys toes. Phoenix, as always, just gets a trim. I was expecting Gen to have to get another pair of what I call Manolo’s. I even had several hundred dollars in my wallet that I was not looking forward to spending in order to pay for his high end feet. When my farrier took a look though he came up with a very interesting game plan. Because the shoes still looked fine, what if we really tried to push it? What if we waited another week or maybe (gasp) two weeks? At first I was not so sure how I felt about that…I mean it sounded so…dangerous. You always hear the abuse cases of horses who have gone for months without hoof care and Gen would be going almost 3 months! I wasn’t so sure about the plan. My farrier replied that he would be more than happy to take my money, but that redoing the shoes at that moment would not be the best thing for my horse. The best thing for Gen is not to have to get the Equi Pack again. Horses get used to this high tech cushioning and often have a hard time going back to normal shoes, let alone barefoot, after long periods with the extra padding. Since the goal is to get Gen back to nothing because it is what is best for his tendon I knew my Farrier had a point. So I agreed to live on the edge, even if I am only doing it for a week or two. My farrier will be back over the weekend to check on how the hoof growth is going. If we can push it another week after that then the game plan is to put Gen in nail on aluminum shoes (with pads of course for shock absorption) and no snow gear (although considering they are predicting 2 seperate snow storms next week we might go with snow gear afterall). After 6 weeks with those on, the shoes and pads will be pulled and Gen will be back to barefoot! Who knew it would be such a process to make my horse right again after a chip in his foot? I have learned my lesson though and now when I see a chip I just call my farrier and he treats the chip and trims right away. I have already put the prevention plan to the test with both boys who were each getting chips on their back feet at one point and getting it taken care of right away is working. In other foot news…Poor Phoenix has a little spot of thrush on his left hind frog. I am already treating it, but I am annoyed that not only did it happen, but that I did not catch it! My farrier did have to cut away to get to it, and also assured me that it was such a small spot it had clearly not been festering for long. It is still annoying though because with all this clean white snow around it is clear where he is getting it and there is nothing I can do to change that situation. At least thrush is treatable and according to Mrs. Mom and my Farrier(who both recomended the same thing) it should be gone in no time with no lasting negative impact. So that is the update on my boys feet and they both say thank you to all the readers who have for weeks been asking about their very precious toes!